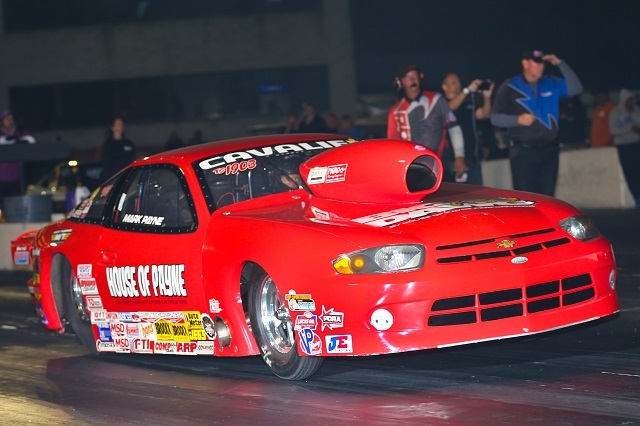 Mark Payne’s family have been consistent competition in the sport of drag racing for over 40 years, with the main word being consistent, Payne is going to venture towards what could be a painful process for most seasoned racers. Mark Payne is leaving the power adder world of big-inch nitrous engines for little cubes, turbos, and electronic fuel injection. “I wanted a change, I was tired of nitrous, the between round maintenance, how hard we had to work to qualify. Everyone around us is getting faster. I have been around (Alan) O'Brien watching what he has been doing, he makes a lap comes back look’s on the laptop and has a Coke, I am into that type of program,” Payne chuckled. Mark Payne says that it is not as big of a risk as it was a few years ago when he sold 2 cars to buy one, that one is the 2016 NHRA ZMAX 4-Wide Top Sportsman Champion Car built by North Carolina based chassis builder Wally Stroupe. A car that Payne says he just loves to race and it was time to see what the next chapter holds for the family motorsports team from Virgina. “I started looking for someone to go on this adventure with our family with an LS Combination, I didn’t think that it would be really hard to find someone to say sure let’s build it. However, it was difficult to find anyone to say that they believed that they could make the LS Program consistent with the shark-filled waters of Top Sportsman. Consistency is paramount. I found one place that said sure let’s do it, Tick Performance,” stated Payne. Tick Performance has a reputation as a one-stop shop for LS and LT Performance segment in Mt. Airy, NC. They have over 15 years experience with the LS packages, building numerous radial combinations in racing. Yet they were looking to expand their involvement into drag racing. The perfect storm presented itself with Mark Payne and his family. “Mark had called, emailed and communicated with the office about what he was trying to do with this program, we had a shop car that we were building an engine for, lost interest, the car was sold, here sat this awesome pile of parts. We struck up a conversation and a relationship. Myself along with everyone here is excited to build this engine and start the journey into Top Sportsman,” said Jonathan Atkins, owner of Tick Performance. The build-up process is moving quickly, with parts coming in from Holley, Precision Turbo, Cam Motion, MAST Cylinder Heads, Diamond Pistons, Rogers Automotive, House of Payne Performance and FTI, a goal of mid-March for track time will become paramount as the PDRA Galot Event in April is where Mark and Jonathan have circled as the goal. “I want to run 6 of the PDRA events along with 8 NHRA Events between the National and Divisional schedules, that does not leave time on our side to accomplish this, yet, I know that Jonathan, myself and our partners are as excited as we can be to finish it, no matter what we will get it done right the first time, the professionalism has been first class and excitement well that is truly breaking the needle right now, ” Payne smiled. Payne Motorsports is taking this journey, yet not alone with support from Holley Performance, Tick Performance and Mickey Thompson in their corner, they are ready to take on the challenge of showing the power potential, while disproving that the combo cannot be consistent. “I can not ever stress enough how much Bill and Derrick are helping with this program, you have a company like Holley in your corner, the work ethic, the desire and professionalism of Tick Performance combined with how important it is for us to be successful, heck grab a Coke we are going to get it done,” smiled Payne. Keep up with the progress of Tick Performance and Payne Family Motorsports on Facebook.